Budget conscious and looking for more affordable unli call and text offer? 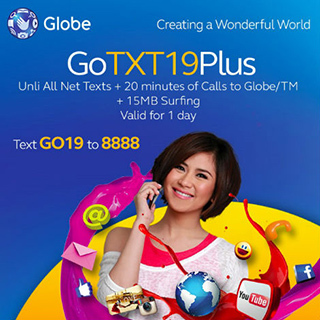 Register now with Globe Prepaid GoTXT19Plus Promo and enjoy unlimited Texts (SMS) to All networks plus 20 minutes of calls to Globe/TM subscribers. Here’s more, promo also include 15MB data for mobile internet access for just Php 19.00 valid for one (1) day. Text all you want anytime and wherever you are. FREE 15MB data of mobile internet access. Globe Prepaid GoTXT19Plus Promo is currently available for Globe Prepaid subscribers and a required of Php 1 maintaining balance to continue use of service. Get to know more about Globe Prepaid latest offers and promo updates by visiting us again. You can also check on Globe Telecom Facebook page for the latest news feed.